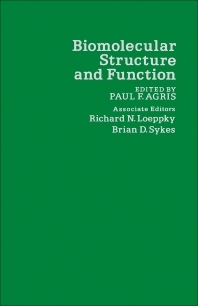 Biomolecular Structure and Function covers the proceedings of the 1977 Cellular Function and Molecular Structure: Biophysical Approaches to Biological Problems symposium. It summarizes the application of several biophysical techniques to molecular research in biology. This book starts by describing the use of deuterium-labeled lipids, as monitors of the degree of organization of membrane lipids. It also describes the use of carbon-13-labeled lipids, as indicators of molecular mobility. It explains the lipid-protein interactions involving two integral membrane proteins, mitochondrial cytochrome oxidase and calcium-dependent ATPase of muscle sarcoplasmic reticulum. The book goes on to present NMR studies on the organization and conformation of phospholipids, chloroplast membranes, and erythrocyte membranes. It also presents the ESR study of spectrin-phospholipid associations. It discusses the use of fluorescence probes, electrokinetics, neutron diffraction and ion theory studies of phospholipid-protein association, hormone disease, and senescence effects on prokaryotic and eukaryotic cells. Moreover, this book presents the experiments and phosphorus-31 NMR methodology to simultaneously monitor the intracellular pH and phosphate metabolism in a beating heart, functioning kidney, or an intact living microorganism. This book then describes physical probing of intracellular fluidity and structural changes attending tissue or cell cycles. It also relates relatively narrow lines in the hydrogen-1 NMR spectrum of the extremely viscous complex of the muscle protein troponin and highly polymerized tropomyosin. Structure-function studies of fibrous proteins, such as collagen, actin, and myosin, and active site analysis of enzymes are also presented. Finally, a wide variety of methodologies and technologies is exemplified. This includes proton, carbon, fluorine, phosphorus, and lithium NMR spectroscopy; spin labeling and EPR spectroscopy; chemical studies; light scattering and fluorescence; and electron microscopy.